We met for our semi-annual brunch on Friday. Although we make a date for "lunch" it seems we always end up ordering breakfast at the River Edge diner! It was good to see the girls and share our stories (the good and the bad) from the past few months. Afterwards we continued at the Cozy Quilt Shoppe where we exchanged some gifts and a few more stories and shopped for more stash. Denise took photos of the occasion. Kris made us each a set of 4 quilted fabric coasters. Rich says they are "really neat". She also gave us each a night light with a photo insert and a picture of her new bunny, Panini. Denise made us each a fabric tote bag with a sewing themed panel by Alma Lynne and included a few "stocking stuffers", a DVD of "How to Make an American Quilt" and a 2007 ornament from Neiman Marcus in our favorite colors. The embroidery designs for the top two are from Loralie Designs Sewphisticates II CD. 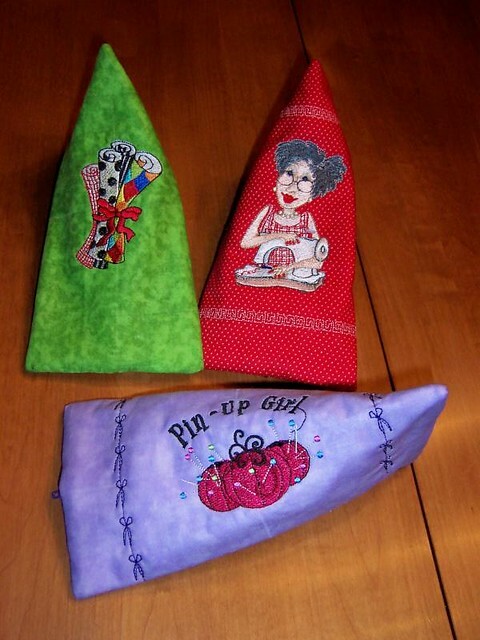 The Pin-up Girl Design is from Cactus Punch's Sewing Sassy CD. I used some of the built-in sewing themed stitches from my machine to "quilt" the outer fabric, cotton batting and the lining before inserting the zipper and sewing the side seams. I serged the raw edges to leave a nice clean finished edge inside each bag. 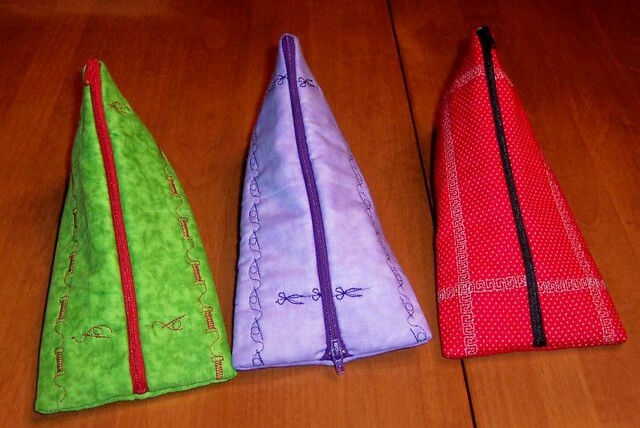 These are the perfect size for carrying a pair of scissors, rotary cutter and other sewing supplies. 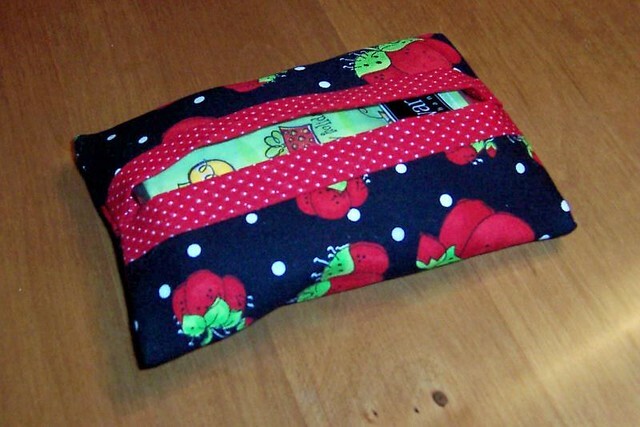 I also made a pocket tissue holder from leftover scraps of Loralie pincushion fabric. Our next road trip is not too far off in the future -- the Quiltfest of New Jersey IV in Somerset is being held February 28-March 2, 2008. We are planning on going on Saturday, March 1 and are hoping to be able to take a side trip to the Viking Sewing Gallery in Colonia, if time permits, just to find out where it is located (since my local shop in West Nyack has closed).